The World Meeting of Families 2018 comes to Dublin, Ireland on 21-26 August. Pope Francis has said, ‘Every family should look to the icon of the Holy Family of Nazareth… “The covenant of love and fidelity lived by the Holy Family illuminates the principle which gives shape to every family”’ (Amoris Laetitia – The Joy of Love 30,66). The Church herself has been called ‘a family of families’ by Pope Francis, and imaged as ‘the Family of God’ by Pope St John Paul II (Familiaris Consortio – On the Role of the Christian Family in the Modern World 15). The Preparation Programme for the World Meeting of Families was launched at Knock in the West of Ireland on 21st August 2017, while the formal Opening will be in every Irish Diocese on 21st August 2018. The 21st of August is a special anniversary, because on that day in 1879 a number of people in the village of Knock saw a strange sight. It was a wet evening around 8pm when a glow of light appeared at the gable end of the parish church. 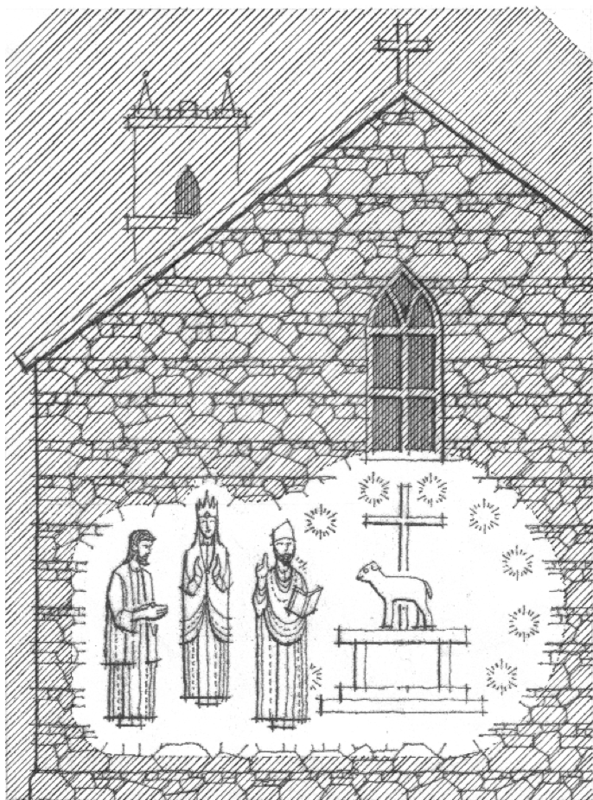 In the centre, under the gable window, appeared a bare altar upon which stood a lamb, behind which was a cross, all surrounded by angels. The lamb faced three figures, St Joseph, Mary and St John the Evangelist. The figures were life size, appeared to be made of light, raised above the ground and standing out from the wall. The figures did not move and remained silent. The Vision was seen by many people, who experienced great joy. Knock soon became a place of prayer and pilgrimage, with reports of many healings and spiritual blessings. The Church investigation concluded that the witnesses were reliable and so Knock was approved as a place of prayer and pilgrimage. Huge crowds greeted Pope St John Paul II in Knock on his visit to Ireland in 1979, the Centenary year of the Vision. 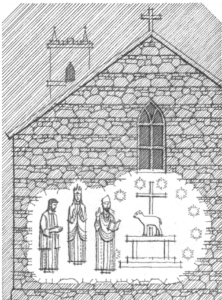 The Vision of Knock is like an Icon, containing the Holy Family of Jesus, Mary and Joseph, the ‘domestic church’, and also the ‘hierarchical church’, represented by Jesus and the Apostle John, dressed as a bishop. It is therefore fitting to celebrate the World Meeting of Families 2018 through reflection and prayer on the Vision of Knock as an Icon of the ‘Family of God’, the entire Church. John the Evangelist, Beloved of the Lord. The Lamb on the Altar, who is Jesus, the Lamb of God.